Colchester boosted their chances of survival in League One with a win over Port Vale, although they remain four points adrift of safety. Mark Marshall and Ben Williamson forced saves from keeper Sam Walker as Vale made all the early running. 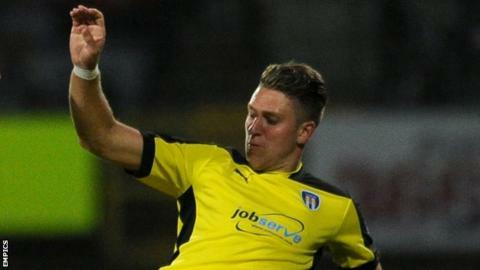 But George Moncur struck a low shot from 14 yards to give Colchester the lead in the 57th minute. A fierce Jacob Murphy shot doubled the U's lead before Louis Dodds volleyed in a consolation goal for Port Vale. Defeat leaves Vale looking over their shoulders as they sit only four points ahead of the drop zone with six matches remaining. Match ends, Port Vale 1, Colchester United 2. Second Half ends, Port Vale 1, Colchester United 2. Gavin Massey (Colchester United) is shown the yellow card. Frederic Veseli (Port Vale) is shown the yellow card. Foul by Frederic Veseli (Port Vale). Attempt missed. Rhys Healey (Colchester United) right footed shot from the left side of the box is close, but misses to the right. Attempt saved. Tom Pope (Port Vale) right footed shot from the centre of the box is saved in the centre of the goal. Goal! Port Vale 1, Colchester United 2. Louis Dodds (Port Vale) right footed shot from very close range to the top right corner. Assisted by Tom Pope. Corner, Port Vale. Conceded by Richard Brindley. Corner, Port Vale. Conceded by Tom Eastman. Substitution, Colchester United. Sammie Szmodics replaces Tom Lapslie because of an injury. Attempt missed. Gavin Massey (Colchester United) right footed shot from the centre of the box is just a bit too high. Attempt saved. Carl Dickinson (Port Vale) right footed shot from outside the box is saved in the top centre of the goal. Goal! Port Vale 0, Colchester United 2. Jacob Murphy (Colchester United) right footed shot from the right side of the box to the bottom left corner. Attempt missed. Gavin Massey (Colchester United) right footed shot from the left side of the box is too high. Attempt missed. Michael Brown (Port Vale) right footed shot from the centre of the box is close, but misses to the right. Attempt blocked. Mark Marshall (Port Vale) right footed shot from the right side of the box is blocked. Mohamed Coulibaly (Port Vale) wins a free kick on the left wing. Attempt missed. Chris Porter (Colchester United) left footed shot from outside the box is close, but misses to the right. Attempt missed. Tom Pope (Port Vale) right footed shot from the centre of the box is close, but misses to the left following a corner. Corner, Port Vale. Conceded by Alex Wynter. Attempt saved. Richard Brindley (Colchester United) right footed shot from the centre of the box is saved in the centre of the goal. Substitution, Port Vale. Chris Robertson replaces Neill Collins because of an injury. Foul by Neill Collins (Port Vale).